Facilities – W. Silver, Inc.
W. Silver Inc., is committted to providing the highest quality standards for our customers through the selction of only the best resources. We use the latest in production standards that produce consistent quality and we measure the results using industry standard testing instruments. Zero work-related injuries is always our goal. We can attain zero. In many departments it is already here thanks to dedicated effort and a firm commitment to our core values. One of which is to work safely every day in a manner that protects our employees, contractors, customers, and the communities where we operate. We keep our most common items in stock and ready for shipment at all times. We offer a range of size and finish for our T-Post, Grape Stakes, and Erosion Control Stakes. After receiving the rails from the Yard department, our rails are heated in a reheat furnace to more than 2300ºF to prepare them for slitting. 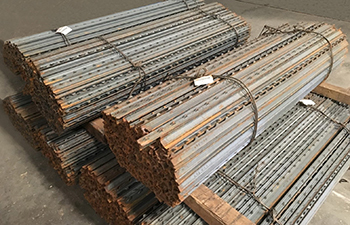 After reheating, the rails are processed into finished hot rolled sections in the Mill by slitting, head, web, and base of the rails and routing them to a series of mill stands where hot rail sections are progressively reduced and shaped into rail steel products. Finally, the rolled products are transferred to our Finishing Department for any additional processing, storage and shipment to our customers. At our finishing department our rolled products are finished into studded steel T-posts for the farm, ranch and vineyard industries; angle steel use for a variety of applications such as bed frame manufacturing industry; and rebar for paving applications. We have punching, painting and fabrication capabilities. 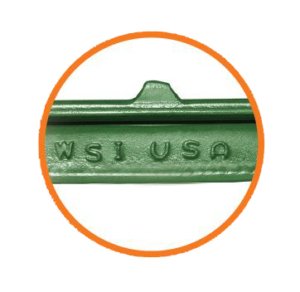 All WSI products are manufactured in the U.S.A. from 100% rail steel. 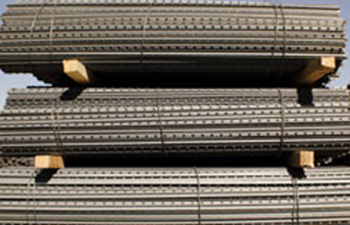 WSI uses scrap rail from used rail road tracks as our only raw material. 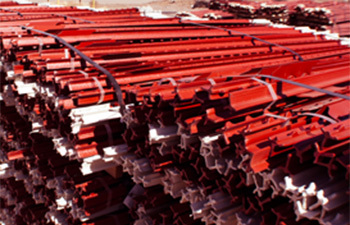 The rails are sorted by size, prepared and cut to specific length at our on-site Yard facility. Our Freight Department works daily to make sure your deliveries happen on time every time. We work with only the best, W. Silver Inc. prides itself for hiring only DOT compliant carriers with the appropriate insurance requirements. Ask for our list of “approved carriers”. Making sure your orders arrive on time and as they left our facility is a critical goal. We are a Rolling Mill and manufacture American made products. W. Silver Inc.. re-rolls various weights of used railroad rails into products that start a new life in the farm, fields and homes across America. Our products are frequently used as steel T-posts at farms, vineyards, olive orchards and raisin farms, which means that W. Silver Inc. literally supports the fruits of USA labor. The agricultural market in particular prefers our re-rolled steel because of the increased carbon content – it makes our product superior to others that are used in similar applications. Our products are known for their strength, robustness and longevity. Rails are heated in a reheated furnace to about 2300°. Rail then passes through series of rolling stands, where it gets formed into a customer-required shape (such as T-post, Bed Angle and rebar) . After cooling, Long-length products are sheared to customer-specified lengths after going through series of quality checks. Cut to length T-posts are finished by bradding and painting them at the automated paint line. Posts pass over the mono-rail to the off-loading station, where they are stacked into final sub-bundles and finished bundles.